From our state-of-the art manufacturing facilities in China, more than one hundred engineers establish and oversee the excellent quality tire production necessary to the most stringent requirements throughout the world. For example, our tire products have received ISO9001 and ISO9002 certification and are DOT (United States of America's Department of Transportation) registered and compliant. At present, heavy-duty truck, light-duty truck, and agricultural tires are among the different types of quality products produced under the He Shan flag brand. The private brands Black Circle, Black Fire and Black Belt are also exclusively produced at our factory. 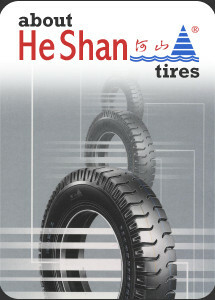 Accompanied by the expertise of 21st Century Tires and their global marketing connections, He Shan Tires looks forward to demonstrating the high quality of our products and deep desire to satisfy our customers in the twenty-first century.